How to control HomeEasy HE8xx modules. RFXCOM supports the HomeEasy AB600 (ARC), HE2xx (AC) and HE4xx (HE EU) protocols. The HE8xx protocol is not supported! But the HE8xx modules can be controlled by RFXCOM using an ARC, AC or HE EU protocol. The HE8xx remote transmits multiple protocols, eg HE8xx, HE EU, AC and ARC. If a HE8xx dimmer is paired with a HE8xx remote the HE8xx protocol is used. The RFXCOM receives only the HE EU, AC and ARC protocols. If you try to control the HE8xx dimmer with one of these received codes is does not operate because the dimmer is using the HE8xx code. 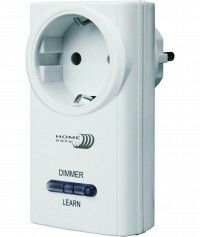 Put the HE8xx dimmer in learning mode and transmit an ON command with the RFXCOM using one of the protocols and codes (house code, ID, unit code) as received by the RFXCOM from the HE8xx remote. The HE8xx dimmer can now be controlled using the HE8xx remote and the RFXCOM. This entry was posted on Friday, February 27th, 2015 at 9:29 pm and is filed under Using. You can follow any responses to this entry through the RSS 2.0 feed. Both comments and pings are currently closed.